We finally got our first call for a foster care placement last week. We were able to go together as a family to pick up little Baby M. He was 1 1/2 weeks old and so tiny! We just loved him right away. He was so sweet and easy-going, and it was such a joy having him in our home. Nothing is ever certain with foster care, but we were told that this should be more likely than a normal case to be permanent (and I mean, adoption permanent). On top of that, we were his third home in ten days (and that's not counting the hospital), so regardless of length of stay, we knew he needed someone to invest in him and attach. Can you imagine a little baby who hasn't had any chance to start the attachment process by two weeks old? Young as he may be, that has to be damaging. So, anyway, we loved on him, fed him through the night, and enjoyed his sweet smiles and little baby sounds. Our first full day with him landed on Josh's day off, so we got to be together as a family of four for the day. Big Brother A did well with Baby M, although he probably wasn't super thrilled to be sharing the attention! Some favorite moments were our walk with the double stroller and family story time on the couch. 24 hours after picking up Baby M, we got a call from the case worker asking us to please bring Baby M for pickup by his bio family immediately. We'd heard of quick turnarounds before, but this was pretty unexpected. Again, we'd been told he would probably be with us for a while. They don't generally move a child from emergency care to a permanent home for a one-night stay, as every move is a disruption to the child's life. If there had been any indication that Baby would leave so soon, he just wouldn't have been placed with us, for his own sake. Baby's clothes and belongings were hanging up to dry on the clothes bars, including the new things we'd bought just for him and the very few items he had come with. We got a second call to please wait about 15 minutes to leave, so we tried our best to collect ourselves, throw everything in the pay dryer in the basement for as long as possible, and pack both boys into the car. We even tried to squeeze in a quick moment of goodbye. We've never done this before, and we didn't know what to expect or what the bio parent needed from us. We didn't have time to ask. We got to the right area on time, but we had the wrong address and couldn't find the right building despite multiple phone calls, so we showed up 15 minutes late and totally frazzled. Add to this our emotional state and frustration at the situation, and I was left unable to even tell them what time he'd last eaten (what time was it now, anyway?). Little Baby M was carried straight over to Dad's car, and that was that. We were left to figure out how to cope. We'd just finished moving up the newborn things from the basement. There was the new little pack of tiny diapers and the pacis that Baby M had used. Bottles, clean and dirty, were still at the sink. Baby's swing and pack n play were set up for naps. 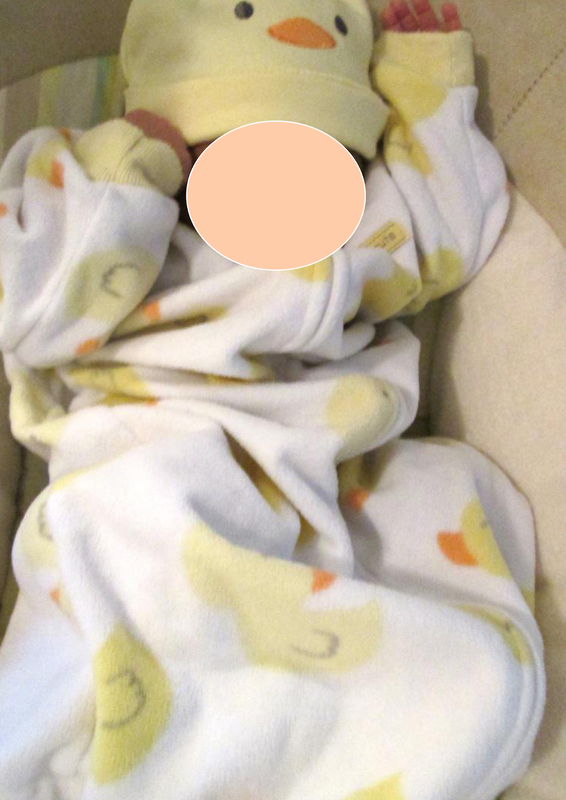 Burp clothes were scattered in convenient places for fast clean-up during feedings. And those sweet little newborn clothes that we had picked out just for him - those were still drying on the clothesbars - too damp to send with him, and too late to return to the store. We're hoping we can still use those little baby things. We're hoping it will be soon. It's hard to wait so long, finally get a placement, and be without a foster child again so soon. It's hard to know how much you're allowed to miss someone when you always knew they might leave soon - but you also knew they might stay forever. It's hard to feel justified in mourning someone that most of our friends didn't even get to meet. It's hard not knowing if Baby M is getting good care now. It's all just hard. We're so glad to be doing what we're doing. We're so thankful for the support we've gotten from friends and family. We're grateful that Big Brother A is still small enough that this is only confusing, and not heartbreaking, for him. By the time he's old enough to feel more of the impact, we hope to have a better idea of how to cope and how to mourn in a way that will best support him. We're glad that we have a big God, whose plans are always best, and we will continue to lean heavily on Him. I'm reminded of 1 Peter 1:22, which says, "Now that you have purified yourselves by obeying the truth so that you have sincere love for each other, love one another deeply, from the heart." There's no room for cautious love here. We're hoping to work with babies, children and families who are in difficult situations and desperately need love, stability, and unafraid attachment. Whether these kids are in our home for one day or hundreds before saying goodbye, I hope that we will always be heartbroken when they leave. I want to love them deeply - from the heart - just as Jesus loves me. Ahh my heart is with you..you need to so strong in what you are doing..and I still feel ANY child is so very lucky to be placed into your family..no matter for how long. Short term or long term, it will full of loving care. Hugs to all.